Experts are increasingly worried that the ramp up in tariffs between the U.S. and China will make it more difficult to end the trade wars between the two biggest economies. Stock strategists say the market rose on a relief rally, shrugging off concerns because the tariffs are lower than expected. But Moody's and others warned the escalation means it's more likely the global economy and U.S. consumer will take a hit from the trade friction. Stocks are shrugging off the latest round of tariffs between the U.S. and China and rallying on Tuesday, even with warnings the trade war could be more prolonged and harmful to the global economy than many investors believe. The Trump administration slapped 10 percent tariffs on $200 billion worth of Chinese goods Monday and said those tariffs would rise to 25 percent as of Jan. 1. China retaliated with its own tariffs on $60 billion in U.S. goods. "It's a very modest response," said Edward Alden, a senior fellow at the Council on Foreign Relations, of China's reaction. "There's no question China's hurtingand they may want to negotiate. The problem is the Trump administration may be overplaying its hand. The harder they push, they may push the Chinese into a corner where politically and for just reasons of saving face, they can't negotiate with the administration, and secondly the administration hasn't established a negotiating process. There's a real divide between the trade hawks and doves." Moody's warned Tuesday that the latest round of tariffs reinforces its view that the trade tensions could be long lasting and would be "material for the global economy." The tariffs could reduce U.S. growth by 0.2 percentage point next year, and China's by 0.3 to 0.5 percentage point, Moody's said. It forecasts 2.3 percent U.S. growth next year. and Chinese growth of 6.4 percent. "Higher tariffs will hurt the economy by distorting prices and creating inefficiencies globally. Companies that rely on global supply chains will likely hold off investment decisions given the uncertainty around tariffs," Moody's said. Likewise, economists at Nomura said Tuesday that there's risk the new tariffs could lead to "a material deterioration of business sentiment and the growth outlook." They said while the final U.S. list omitted some 300 product categories, like Bluetooth electronics and car seats "the wide range of targeted products should have significant effects on supply chains and may adversely affect both consumers and business sentiment." 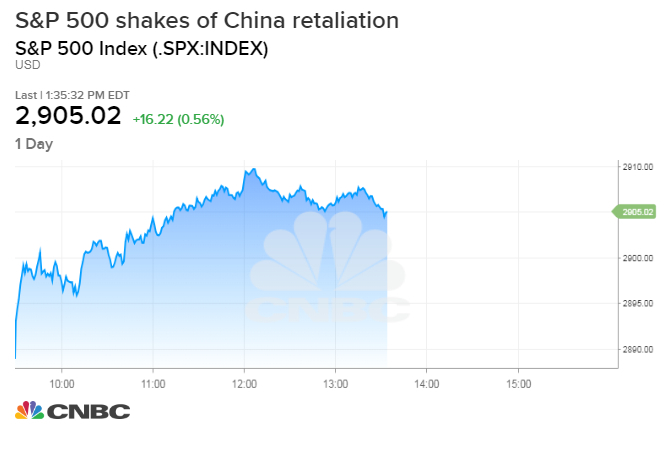 Stocks dipped briefly Tuesday morning when China responded with tariffs of 5 to 10 percent on 5,200 U.S. goods and said it too would raise tariffs again if the U.S. does. But equities then soared, as stock strategists said the tariffs and response were not the worst-case scenario. "I don't think people think this is going to be lasting, even though we keep getting deeper and deeper into this and there's still the belief the U.S. economy is good enough to weather the tariffs," said Peter Boockvar, chief investment strategist at Bleakley Financial. "I think that the landscape is getting more dangerous." Companies have also been warning the tariffs are beginning to squeeze, and could hurt profits in addition to the economy. The Business Roundtable said Tuesday that the Trump administration was right to go after China's discriminatory trade practices, but its unilateral use of tariffs is the wrong approach and the latest escalations threaten further harm to U.S. businesses and workers. FedEx said the tariffs implemented so far already hit about 10 percent of its business in China, and tech CEOs have been warning tariffs will hurt their business and could harm U.S. consumers and the economy. Apple's watch and other products were notably removed from the initial U.S. list in the latest round of tariffs, and that was a positive for shares of Apple, which gets more than 20 percent of its revenue from China. China had been expected to make life hard for U.S. companies, but has instead been holding out an olive branch. China had set up a meeting with financial companies for this week. Capital Economics noted that Beijing was expected to retaliate against individual firms with regulations and boycotts, but since the trade war appeared to become more prolonged, "China's leaders have started to take a softer line, concerned more with not being seen as an aggressor in the trade dispute." CFR's Alden said China's new posture with U.S. companies is understandable. "I think it's sort of very straightforward economic interest. The Chinese changed their position on that," said Alden. "I think they recognized two things — U.S companies are no longer a terribly effective lobbying group with the administration. ... What's the point of squeezing U.S. companies if they can't do anything about it? The second thing is they're worried about investment leaving China." In one province, the local government is offering incentives to help offset tariffs. "I think the Chinese have moved off that. They don't want to drive U.S. companies away. They want to keep them there," he said. Alden said the administration has potentially boxed itself in by using a different strategy. With Europe, it held off implementation of tariffs allowing room for discussion. Another concern is that the U.S. team is now led by Treasury Secretary Steven Mnuchin, more dovish on trade than other administration officials. "They won't think he can bring home a deal," he said. Trump's threat to put higher tariffs in place by the end of the year and tax all goods from China has also not helped. "At best by the end of the year, you might get a framework agreement. Maybe Xi and Trump work something out, but to set a deadline like that, you have no choice but to pull the trigger," Alden said. Trump and Chinese President Xi Jinping are expected to meet at the G-20 meeting at the end of November. Barclays economists Tuesday said they don't expect the hit to the economy to be big but they anticipate it to dent the consumer. "While the net economic cost may be modest, losses are likely to be disproportionately felt by US households, as they face higher prices for many goods. In our baseline scenario of US-China trade, we estimate plausible losses to US consumers at about 0.6% of GDP, some of which is transferred to the government (by way of tariff revenues) and the corporate sector (in the form of higher profitability). We are already seeing some evidence of the effect of tariffs on consumer prices, particularly in the durable goods category," they wrote. Nomura also said it may be the consumer that will pay. "After 20 percent tariffs on washing machines were imposed in February, CPI for washing machines has jumped by roughly the same amount. This precedent suggests the response from consumers could be more acute. "